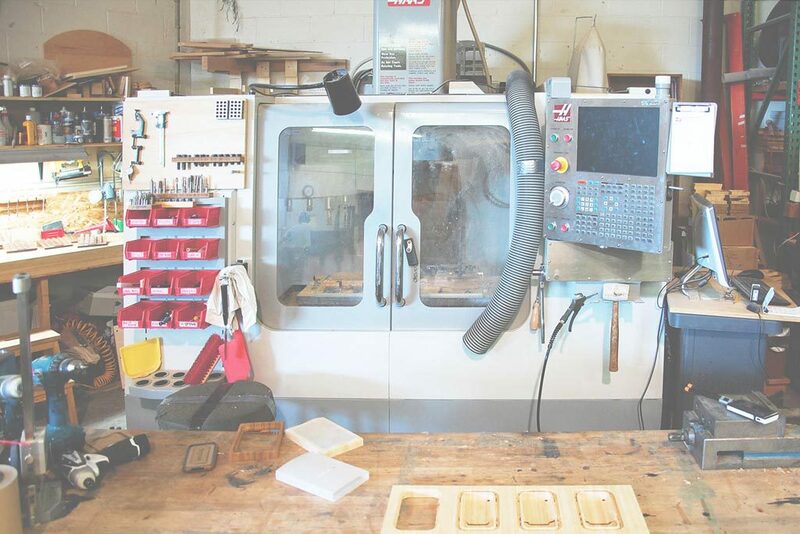 Grovemade is a design, manufacturing, and ecommerce business in Portland, Oregon. 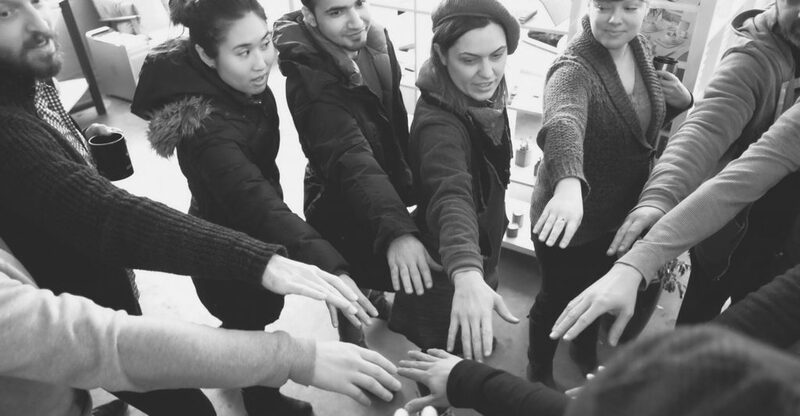 Why don’t we start with what Grovemade is about? Let’s start there. Yeah, that’s a that’s a hard thing to define. I think it means something different to everybody who’s involved. But for me I think it starts with my personal why, and everybody at the company has that personal why. It’s not exactly the same as the company why. We’re together in whatever point in time because it’s close enough for that time to overlap. It’s good. So Grovemade started as more of kind of like an art project. We wanted make cool stuff and have fun doing it. That was literally our business plan. The marketing plan was if we make cool stuff, people will talk about it. Right. Yeah, that’s I mean that’s fairly logical. Yeah. It’s so Portland, right? Over the years, my interest has evolved to maybe where it’s not as selfish but what the company is about. I had no idea that we would get bigger and had no idea of how to develop an interest in how the team can accomplish so much more than an individual. So it’s evolved to be about a team that can accomplish things because of our culture, we can create products that can’t exist otherwise. I think from our customers’ perspective we’re a design company, and internally too, we are a design company. That’s the biggest overlap is we’re driven by design. We’re not making stuff just so it can be sold. We’re not looking for like a niche where we found something like a keyword that we can sell on Amazon. You just make a product for it. We’re designers first. We want to contribute products that there’s a point to, that there’s a reason it exists. We try to find opportunities or feel like we can contribute to the genre and bring something unique. We’ll take a driving force behind the work we do. When I was when I was learning about the origins of Grovemade, i came very quickly to the iPhone 3G that was sort of Phase 1, and the last time you and I talked, you talked a lot about how you want to kind of get away from being companion products and kind of do your own thing. What would you say is sort of the prime motivator behind that? Yeah, we’ve been like pivoting away from the iPhone case thing. I mean since the beginning, Joe and I our vision was not to become an iPhone case company. It’s why all the people that popped up during that time, the name “case” was in their company name. But we already knew that’s not what we wanted to become. So that’s why we’re not called Grovecase or something. The reason I bring that up is because I get the sense that when we talked about your relationship with Tanner Goods, that, yeah, they’re a competitor, but you’re very transparent. there is sort of a natural competition in everything you do. How do you feel that informs the designs that you produce? Yeah, I feel like we we definitely have this culture of trying to be original. I don’t know if that comes from like respect for the competitors. It might just be like our desire to create something. And there’s a really interesting blog post on the wall that where there’s like a philosophical clash there. Because we actually tried to design like something with a little bit more mainstream appeal, and Kevin and Sean were like really against that, you know? Because it’s not what we do. We usually try to create things that are totally unique. We made them all of this great design, and it’s beautiful, well-done, And we just put a ton of time into the details. But at first glance, it’s conventional. So you really struggle with that. The the article is really about that struggle. It’s something we embrace, though, to like disagree on, hash those things out. I think in the early days it was the OGs. You know, the people that started the company. When when you’re smaller, culture is going to happen from the people that are there. Over time, you started zeroing in on key elements, reinforcing them, and making sure the team aligned. Yes. So it’s more to point the ship. But all the stuff, you know, with our team right now and you have the right people, it’s kind of just there. You don’t need to tell people about that. Because they’re here because they’re like that. Well, I noticed with this meeting that I just got to see. I mean, that was awesome, like you you guys weren’t a company. You guys were a team! Nobody planned that. It just happens. You know? I don’t know. Maybe like three or four months ago we just had to do like closing general meeting. Like what’s discussed on the fly and stuff just kind of evolves naturally. Yeah. In in 2016 last year, you were in an interview on Huffpost, and you were reported as saying, “Controlling the process from beginning to end and by having a highly motivated team you can create products that otherwise wouldn’t exist”. 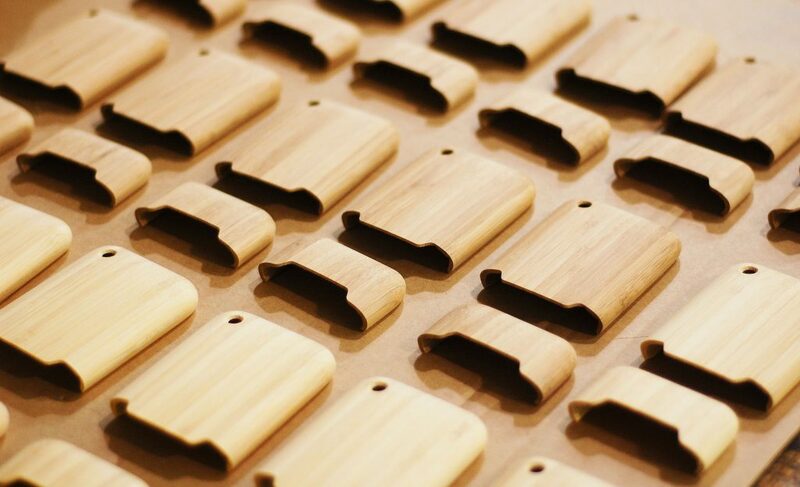 How would you say that drives the products that Grovemade chooses to create? Yeah. That’s core to our identity, I think. There’s some stuff down that is easier. But there’s some stuff that I don’t think can exist any other way like a speaker. There’s nothing like it out there. It’s because it takes so much effort to get there and you have to control it all. The outside people, they’re not going to have that driving them. Do you do you feel like as somebody who’s bringing products to market and you know going and interviewing customers, do you feel like you have a better sense of what they want than they do? Is there empathy, I guess is where I’m going with that. Yeah. I think it’s actually a weakness of understanding what our customers want. Because our company started with like much more simple thinking, like we’re just making stuff for ourselves. And there was a purity to that which contributed to our success. And we’re trying really hard now to get better at learning from customers and we’re finding a good place through it. We’re not just a company creating solutions but also we’re not just like this design company doing whatever they want. We’re using our skills and talking to them trying to find new solutions that they haven’t even thought of. We’re not giving them exactly what they say they want, but we’re listening to them, trying to figure out like what do they really need, and we’re providing that solution. Maybe it’s something they don’t even know existed. That’s the level we want to get to. Well, it’s it’s funny because when you were at Hand-Eye Supply in 2013, you said, “We don’t need to worry about other people if we’re focused on what we do. We’ll just be fine.” Would you say there’s value in the design process Grovemade uses regarding not looking at what other people are doing? Yeah. I think the fact that we’re not like competitive, we’re not like obsessed with copycats and competitors, it gives us an edge because our energy doesn’t think that we believe will be more worth worthwhile. When people give like positive energy focusing on our culture. So it’s an advantage because that negative energy that’s typically sent through those areas is just getting channeled somewhere else. And do you feel like when when a customer opens up one of your packages via the mail, I’m guessing, they can kind of sense that? That’s that’s our hope. You know, it’s not as obvious I think to the average consumer, but I think their experience with us has layers. And at first it’s just the design. It’s like, oh, this thing looks cool. I want it. And as they get deeper and as they buy our products, they engage with us more starts changing into their appreciation for our process and their appreciation for our people and what we believe. And they’re like, “Oh! I believe in the same thing.” You know, it becomes like a deeper connection. And that’s when it’s really good, and our products, you know like that catch-all that is sitting in your home. It’s functional. It’s beautiful. That’s surface level. But we like to be aware it’s more than that to people. And what’s the last thing Grovemade brought to market? The most recent thing is probably the new watch and before that the speaker was a big launch. And the speaker was a collaboration project? Yeah. With Joey Roth. Actually, both of those were collaborations which are pretty rare. Usually we just work in-house. As I’m looking around and I notice these speakers, can you tell me a little bit more about why I’m seeing this beautiful surface on the speaker on the outside, and then there’s there are these bumps on the inside? What’s that all about? Yeah, so speakers started with you know first we reached out to a friend of ours, Joey Roth, who has expertise in the early design. We tried on our own, and it was just too technical. And the design started from him being really excited about he’d show me these audio simulations and he’d explained to me that usually he gets to use like cabinet techniques and it doesn’t fit the audio simulations. So he has to compromise and use all these things of create angles because they’re not you know for stuffing things in there. But he got excited when I came in. I’m pulling up the things you can do with the CNC, and he came up with this idea of sandwiching two halves together. 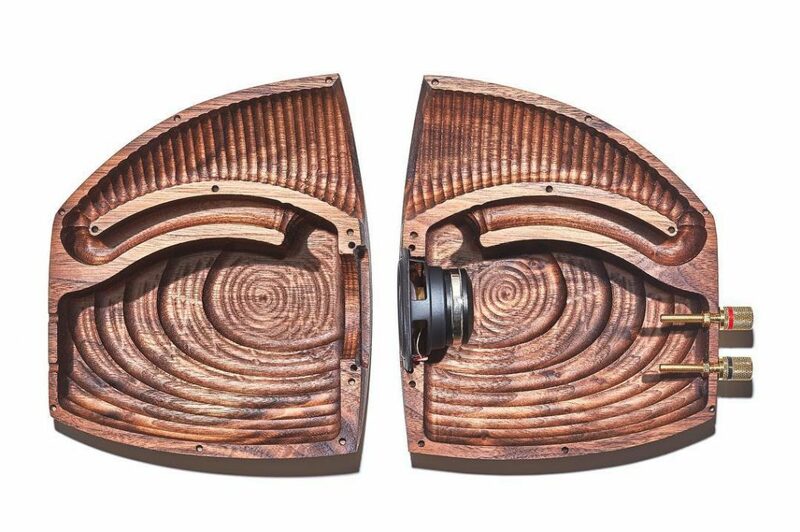 We could create the ideal acoustic form on the inside. And the outside takes a lot of surfacing, as you know. The CNC takes forever. The inside kind of happened when we were we were designing the thing. I was really concerned about the the time it takes to machine it. Right. It almost has sort of a shell sort of thing happening. it’s really beautiful. Well, let me go back for a minute to all the designers who know how to make stuff. That’s the only kind of designer you hire. 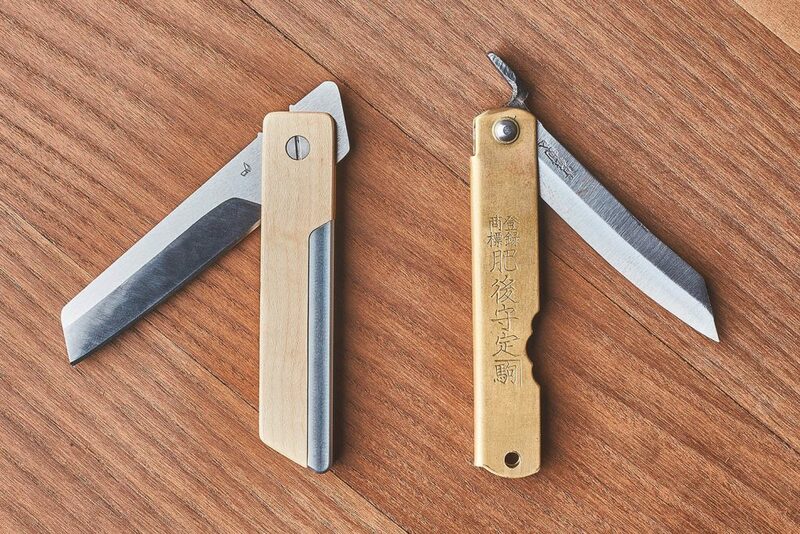 And when we talked a few weeks ago about the pocket knife, you guys had sort of what was that was a workshop with a with a knife maker that kind of gave a consult, or how did that relationship work? Oh, on the pocket knife? That was a lot of work. I personally did a lot of research reaching out to people that make knives. Shops that make knives, just learning as much as possible. And we got a lot of friend help from a friend of mine that works at one of the major knife companies. And he gave us a lot of advice — free consulting. And you know we’re sitting here in…what is this space that we’re in called? Does this have a name? Yeah. This is the showroom. Okay. So I see the showroom. I see sort of like the marketing and the the design areas. I see no inventory. What’s that all about? Yeah, we have very little, so we’re not like a company that buys like 10,000 units at a time from China. Since we do our manufacturing, the the vast majority at least, we do lean manufacturing and have as little inventory as possible. So that’s for multiple reasons. That’s a whole other subject. But the big advantages are you know how big batch is, we can correct things quickly or improve products on the fly. And it also prevents us from waste because everything we do is definitely on the difficult side, and there’s problems. So if we’re doing large batches like we’ve done in the past, and we’ve run into problems where we’d have to throw out like 300 units or something like that…Now if we notice a problem, we waste 10. When I first came in here and you were giving the tour to the Oregon Entrepreneurs Network, you were talking about how you’ll get an order in the morning, and you can ship it end of day, does that does that scale well? Like say you’re going to get a hundred orders in the morning. Can you keep up? It depends. It depends. There’s definitely a limit. We have some finished goods in inventory. We try to have a little bit there so if something goes wrong it doesn’t go all the way to our customers. So we have some. It’s just very little. So usually people are pick and packing from the finished goods, and we’re replenishing the finished goods. So it’s it’s not a true pull, but it’s close. Yeah, yeah. Just going back there and looking at the machines they use to produce the stuff, it’s obvious that it’s it’s a low low volume production line effectively, right? You can do a whole bunch of iPhone cases at once, but the speaker is what at four at a time, four halves at a time? Yeah, in the one day we’ll probably only make two. It takes so long. So in theory we’re supposed to have finished goods. It’s kind of like right now for example there’s a bunch of products that have zero inventory. So on that morning meeting the equivalent of the afternoon one Victor writes, like they have to do these today. They have to ship today. So it goes from raw material, all the way through, and ship it out so it’s not late. You don’t want to do that because it’s inefficient. Because you’re making like little batches and like reacting. That definitely happens. You talked about the mat over there, the for laying everything out on. Does that, first of all, does that have a name? Okay. So the blotter pad. is that going to be sort of championing, ideally, everything? Could everything fit on there that you make? Yeah, it’ll be a slightly different use case because you wouldn’t have a mouse pad. It’s really for people who have wooden desks. So the contrast is better. And where did that idea come from? We’ve been kicking it around for a long time. Mostly because there’s like this frustration where we find the ideal customer type. Let’s say it’s you. And you love wood. You’re a designer. And you believe you believe in well-crafted objects. And let’s say we’re marketing to you, but you might not even be a possible customer because you maybe you don’t own a desk or maybe a wood desk. And you don’t want to have wood on wood. Right. Yeah. You need that visual break. That makes sense. We were talking a little bit about practical versus theoretical, education and I’m looking forward to writing about this topic because I I hadn’t really even considered it. Or I mean I’ve talked about it personally, but I’ve more actually wrote about it. And when slow, you have your designers working in the shop. what’s the value in that? Yeah. But there was a year, not last winter but the previous winter when it was part of our strategy to deal with the seasonality. You know, everybody was in there including me and Jim. I think the value, well for the designers — it’s kind of circular reason but reasoning, but I only hire designers that know how to build. Because it’s so important to begin with the process. Now Sean was in production for years, and he was production manager. For yeah, three years or something. So he obviously knows how to make stuff in our way. So if the designers didn’t know how to make stuff, we’ll have problems because we have to make it. And it might be that designer. As we’ve gotten bigger, we’ve gotten even less connected to the making part. When we were smaller, we were like jammed in together, and everybody was doing everything. And over the last couple of years, we’ve gotten more separated. I mean, obviously more integrated than other companies. It’s also fun for us to go back there. You know, it’s not something I want to be doing full-time at this point in my career. But I still like making things. Do you do do you do personal projects back there? Yeah, I do. Everybody at the company is allowed to if they ask me for permission. A few people do, but I probably use it the most. I mean, hell, if you have the machines power on! I don’t use the CNCs because they’re too dangerous. I mean dangerous as in like I might break something. Yeah. You gotta to know your own limits! And I can’t program anymore. But yeah, I remodeled my my place, did probably half the work myself and then just little projects here and there. It’s still fun. So what would you say is the future of Grovemade? I think the future is: we’re going to get more sophisticated. I think the era of the the mid-level like simple maker company is coming to an end. the Internet is not this glitch anymore where it’s too easy to get free publicity. I’m excited about it, that it’s not going to be a free ride anymore. I feel like our culture is strong enough that we can learn to be more sophisticated digital marketing, eCommerce, but with stronger business. So our future is in becoming a stronger business, more sophisticated. It’d be nice to grow a little bit, to have more reach, and also so we can do more cool stuff. Thanks again to Grovemade for having me over to celebrate them as the first member of the Good Design Cohort! Are you interested in nominating your company for the GDC? Apply here!